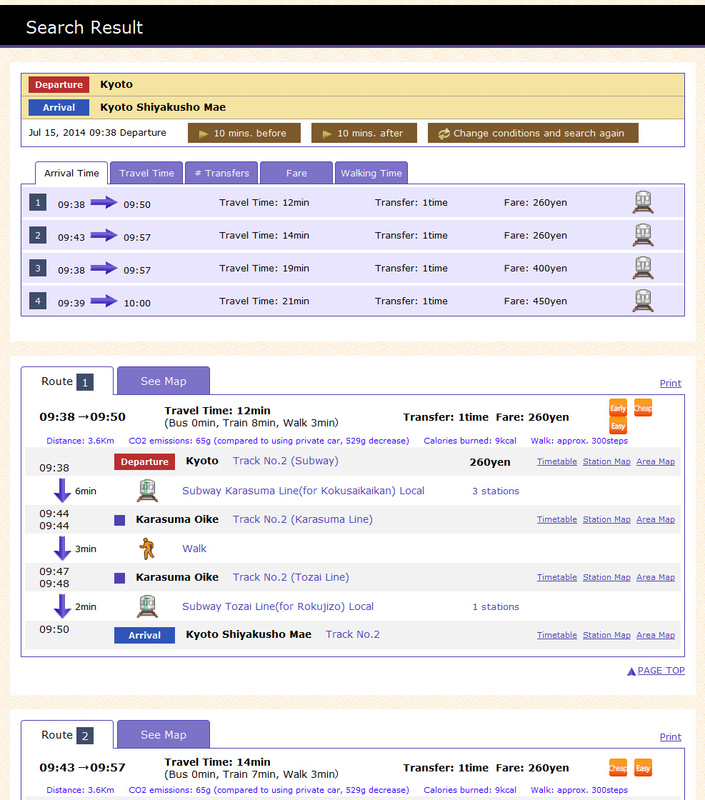 "Arukumachi KYOTO Route Planner" is an easy-to-use free search application offering information on available routes, timetables and fares for city buses and rail services in Kyoto City, simply by entering point of departure and destination. (1) Enter "Point of Departure" and "Destination". Bus Stop, Station Name or Location can be entered. Possible search results will appear as you type　part of full names. "Point of Departure" and "Destination" can be swapped. (2) Enter Specific Times and Conditions. Intended "Departure" and "Arrival" times can be entered. "Earliest" and "Latest" search options available. 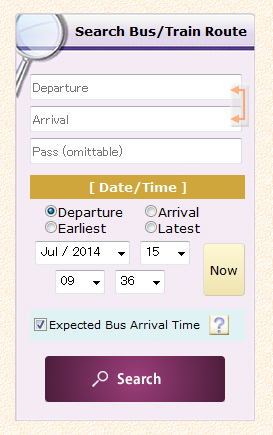 Can select "Expected Bus Arrival Time" option. (4) Search Results will be displayed. Location can be chosen as "Point of Departure" by clicking on the map. "Point of Departure" can be reset by clicking on the "Point of Departure" icon. After "Point of Departure" has been chosen, "Destination" can be chosen by clicking a location on the map. "Destination" can be reset by clicking on the "Destination" icon. Both "Point of Departure" and "Destination" can be reset by pressing the [Reset] button. Locations can be searched by entering addresses direct. 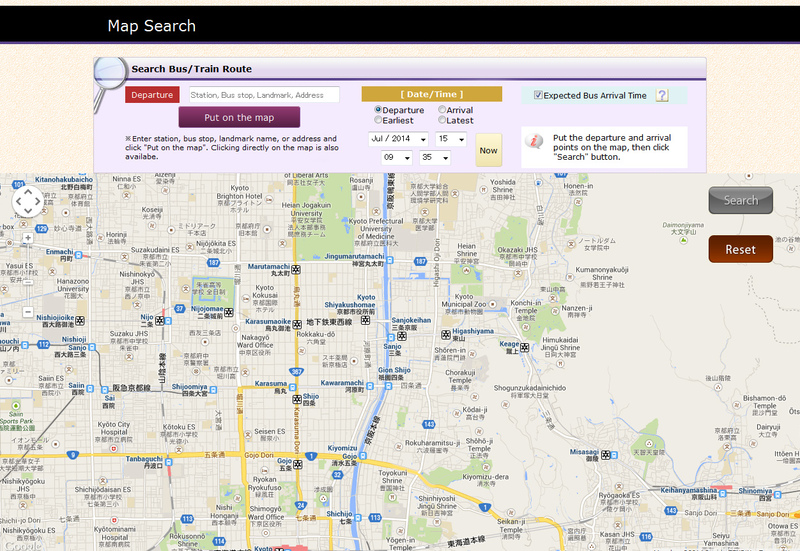 Maps of train stations in Kyoto City can be searched. (1) Choose railway operator or station name. 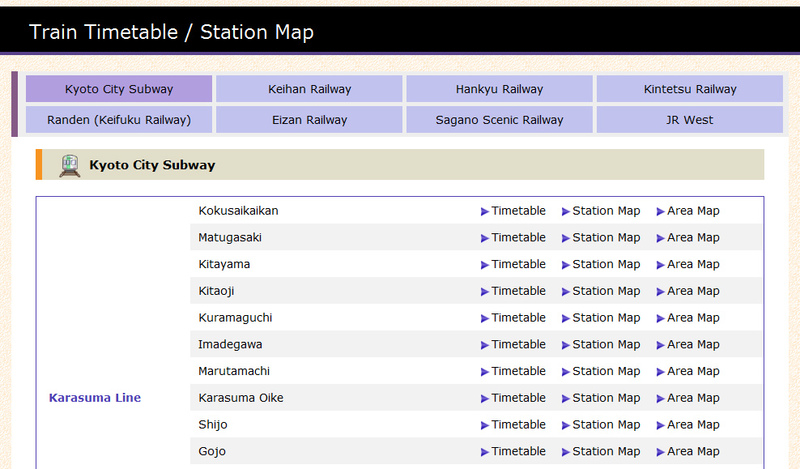 When choosing a railway operator, a list of station names for each line will be displayed. 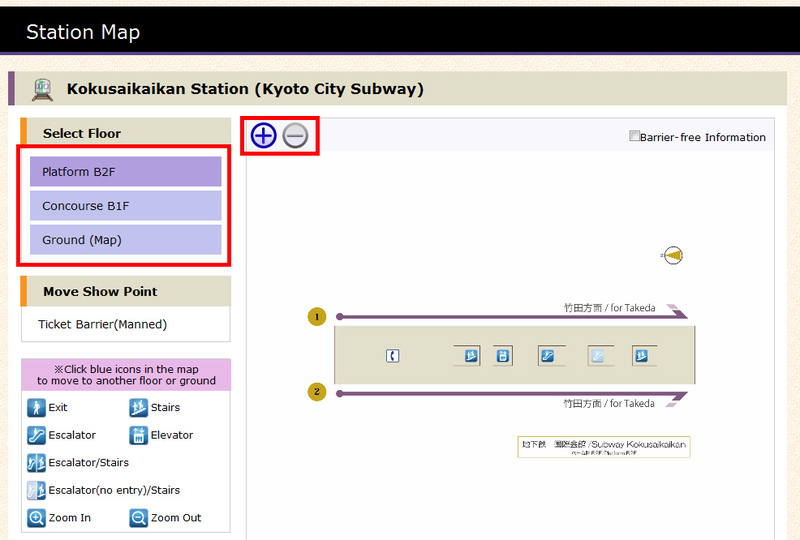 On pressing the "Station Map" link of the selected station, you will transfer to map page. (2) Pressing the button to the left, select the floor you wish to view. Station maps can be viewed by floor. Pressing the ticket barrier will move it to the centre of the screen. Pressing the [ + / - ] at the top of the station map screen, "Zoom in and Zoom out" option available. Arrow will appear when placing mouse pointer on icon. If you press the upper arrow, you will move up a floor. If you press the lower arrow, you will move down a floor. No arrow will appear when moving on the same floor. Human character figure will appear at destination. When connected to outside the station, will transfer to a screen map. Location can be changed by dragging the station map. The route planner "Arukumachi KYOTO" is able to predict expected bus arrival times as a result of compiling and analysing tracking information on present bus locations received real time from GPS (Global Positioning System) tracking technology being installed on every bus. The Expected Bus Arrival Time option utilizes existing traffic jam prediction technology and projects required travel times between stops. 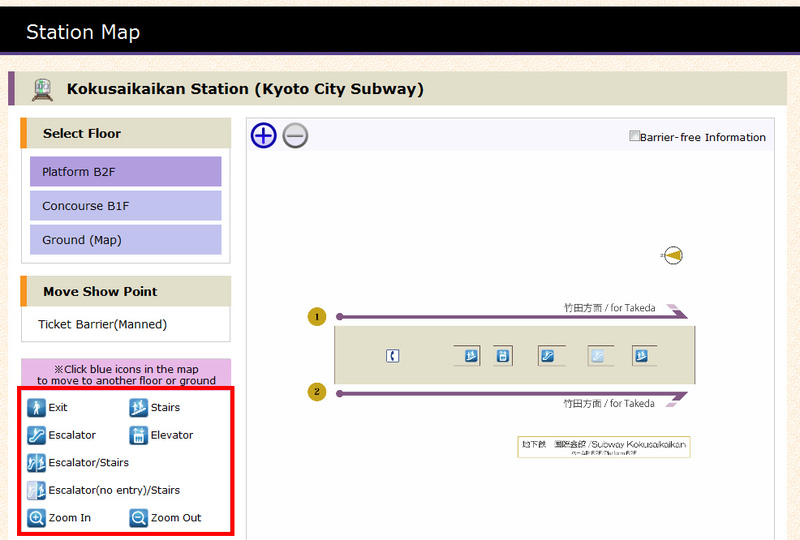 When making searches with the Expected Bus Arrival Time option 「ON」, predicted arrival and travel times will be displayed. Predictions will be displayed in red font (data in black font will be from standardized timetables). When using the Expected Bus Arrival Time option, only data for the above bus operators will be covered in search results. For this reason, depending on point of departure or destination, no data may be available. In this instance, please search again with the Expected Bus Arrival Time option "OFF" (search results from standardized timetable data will be provided). Due to errors with the GPS tracking or problems arising with the wireless signal reception, on occasions the present location of buses may be unable to be determined. In these instances, the Expected Bus Arrival Time option will be unavailable. Predictions on expected arrival and travel times are calculated upon past statistics and recent reports on traffic conditions, so discrepancies can arise in information provided and actual present circumstances.